Below are daily writing prompts for the month of June. The majority of the prompts are related to the various events on our June Events Calendar. These events include birthdays, holidays, monthly celebrations, and important dates in history. Some of the dates include two different writing prompts to choose from. You can download a PDF form of the writing prompt. Even though your students may not be in class all the days of June, use the prompts from those days as additional writing practice. Don't forget to also print a copy of our June Events Calendar. This will help you utilize the daily writing prompts. We also have many other June Activities, Lesson Plans and Resources. Write a poem that honors your father. Where would you want to go? What would you need to bring? 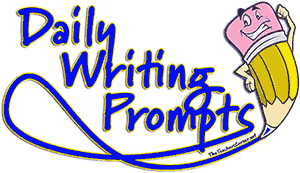 DISCLAIMER: We have provided “suggested” grade levels for some of our writing daily prompts. These suggestions are made based on the content of the prompt, the interest level of the topic, or the level of background knowledge needed to have the most success possible with the prompt. Please remember that these are suggestions only and each prompt can be modified as needed by you, the teacher. Don’t hesitate to get creative and rework the prompt to best fit the age/needs of your students! Return to the Writing Prompts index. Please give us feedback on our Daily Writing Prompts! What can we do to make them better? What other worksheets would help you? If you get a chance, please tell a friend!